Hey, hey, hey! It's the second Thursday of the month and that means it's time for another OSAT Blog Hop! Welcome! This month our theme is "Vintage." When I think of vintage I tend to think of beautiful, aged, old, lacey things with lots of neutral tones... I just wasn't feeling inspired to make that kind of vintage. After a lot of thought I realized that I actually LOVE vintage style things! When I was younger I was a bit of a hippy thrift store shopper. There was nothing better than scoring some vintage clothes with wild colors and patterns! I started to think of all of the amazing vintage things that I love: tea cups, china, wall paper, sheets, wedding dresses... seriously, the list goes on. 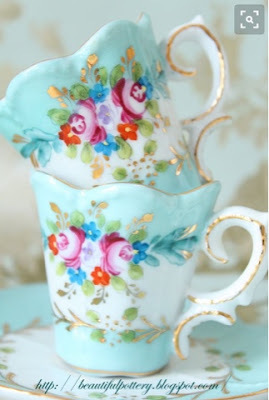 I stumbled across this picture of vintage china tea cups and my jaw dropped. This color combo paired with gold is so gorgeous! So, these cheerful vintage teacups are the inspiration for my projects today. I hope you'll like them. For my card I used a new stamp set called Flirty Flowers. As soon as I saw this set I knew I had to have it. I love that it has both solid and outlined images that are whimsical and beautiful. I heat embossed the images in gold and then watercolored with Berry Burst, Daffodil Delight, Lemon Lime Twist, Emerald Envy and Pacific Point. It's hard to tell but all the flowers are sparkling with Clear Wink of Stella. I layered my image piece over a Pool Party mat, fringed with lace. 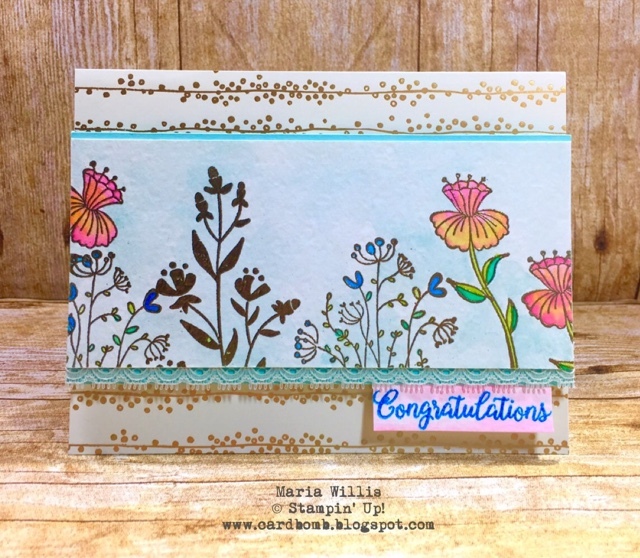 My sentiment is heat embossed in Pacific Point and watercolored in Berry Burst. That beautiful background is from the Bundle of Love DSP. For my project I made a couple of pillow pouches. I've never made these before and I figured out a way to do them with my framelits that makes it really easy (video coming soon). 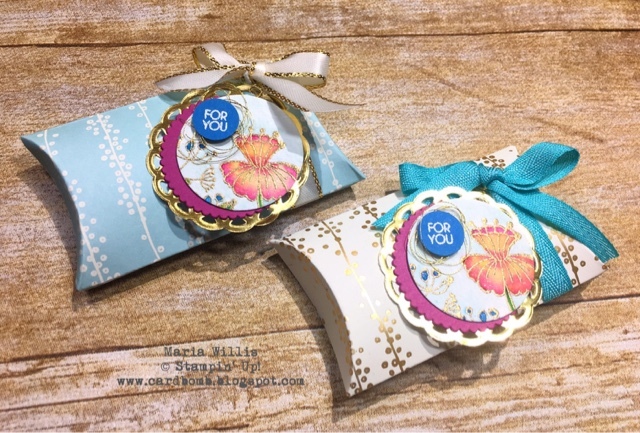 I watercolored these tags the same as I did my card then layered them over Berry Burst (cut with my layering circle framelits) and a small gold, foil doily. 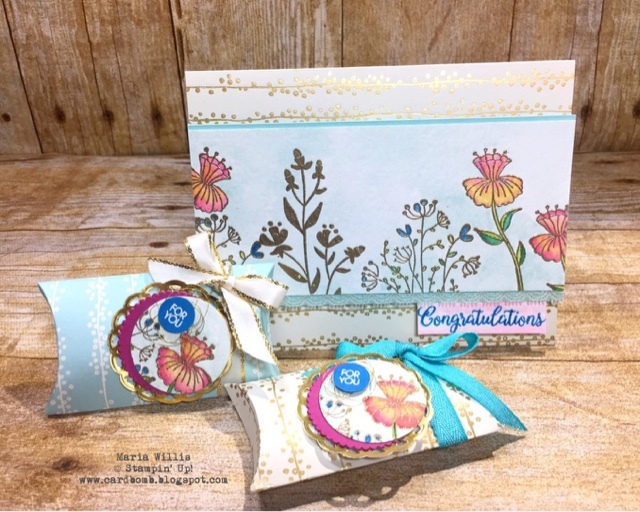 I added a sentiment heat embossed in white on Pacific Point with some loops of gold metallic thread popping out. Here's a last look at everything together. It was really fun making these Vintage inspired projects. Don't be surprised if you see some more vintage cards and projects popping up here soon. 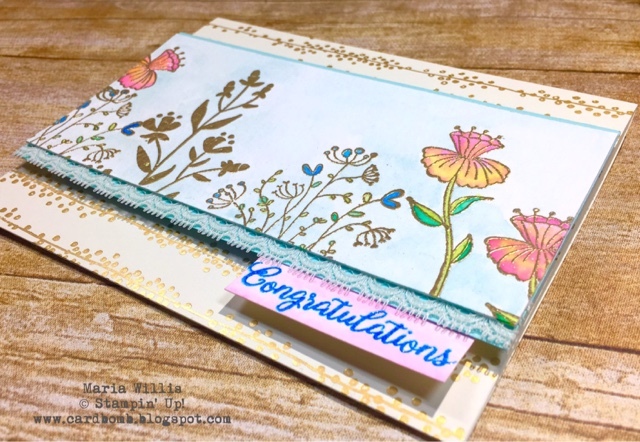 I hope you'll continue on this hop and be inspired by the rest of the incredibly talented artists who have made vintage inspired projects to share with you today. Next on the hop is the fabulous Rick Adkins! Thanks for stopping by today! See you back here soon I hope. Beautiful projects! Your coloring is gorgeous! So colorful and I love those little pillow boxes! Beautiful projects. Love that we both used the same DSP. I love your inspiration pieces as well. I love tea. Thanks Renee! Great minds think alike, huh? That tea cup is so gorgeous!